When the United States government passed the Bill of Rights in 1791, its uncompromising protection of speech and of the press were unlike anything the world had ever seen before. But by 1798, the once-dazzling young republic was on the verge of collapse: Partisanship gripped the government, British seizures on the high seas threatened the economy, and war with France looked imminent as its own democratic revolution deteriorated into terror. The First Amendment suddenly no longer seemed as practical. So that July, the Federalists in Congress passed an extreme piece of legislation, which President John Adams signed into law, that made criticism of the government a crime. 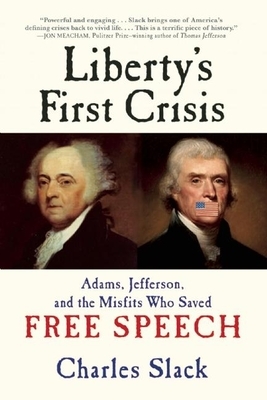 In Liberty's First Crisis, Charles Slack tells the story of the 1798 Sedition Act, the crucial moment when high ideals met real-world politics and the country's future hung in the balance. From a loudmouth in a bar to a firebrand politician who was reelected from jail to Benjamin Franklin's own grandson, those victimized by the Sedition Act were as varied as the country's citizenry. Men and women were harassed and arrested by authorities who believed that speaking out against elected officials was both unpatriotic and dangerous. But Americans refused to let their freedoms be so easily dismissed: They penned editorials, signed petitions, and raised "liberty poles," while Vice President Thomas Jefferson and James Madison drew up the infamous Kentucky and Virginia Resolutions, arguing that this time, the Federalist government had gone one step too far. In engaging, animated prose, Liberty's First Crisis vividly unfolds these pivotal events in the early life of the republic. Here are Adams, Jefferson, Madison, and a wonderfully rich cast of misfits battling it out for the heart of America--struggling to define the fledgling nation and preserve the freedoms the Founding Fathers had fought so hard to create. Charles Slack is the critically acclaimed author of three previous nonfiction books, including "Hetty: The Genius and Madness of America s First Female Tycoon" and "Noble Obsession: Charles Goodyear, Thomas Hancock, and the Race to Unlock the Greatest Industrial Secret of the Nineteenth Century." He works for Time Inc. in New York and lives in Connecticut with his wife and their daughters."